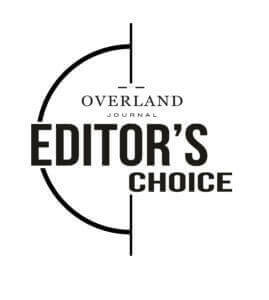 See how we stack up against the competition by Overland Journal. This data and category assessments can help you to make the best decision. 1. The Off Grid is a larger trailer, but the massive tires and generous ground clearance create a balanced look. 2. There are top-shelf Dometic kitchen components throughout. 3. Everything is easy to set up and put into service. 4. The sleeping area was one of the most comfortable in the test. 5. A propane shower is a nice touch and is easy to access. 6. Despite the slightly larger size, the Off Grid was flawless on the trail. Since the Editor's Choice award, Off Grid Trailers updated all models! It came down to the Patriot and the Off Grid. Patriot X1 is the most refined solution of the test, with exceptional attention to detail and manufacturing quality along with the best suspension in the evaluation. The Patriot also handily won our objective testing, combining high scores in most categories and winning or tying in 4 of the 10 categories. It was the empirical champion, but it fell short in a few areas I find essential: principally, the ability to sleep inside the shell. If I am going to tow a trailer, I want it to provide four- season shelter and allow camping on any surface condition, even in the middle of a muddy or rocky track. Sleeping inside a hard-sided trailer provides noise isolation and insulation a tent simply cannot deliver. These teardrop-style units also allow for instant camp setup, as the bed is left made, and it only takes opening the door to be moments from slumber. So for me, the Off Grid Expedition wins, as it fared well in all categories and provided the most convenient and insulated sleeping experience. It was not quite as comfortable as the Conqueror, but it was far more capable in technical terrain and lighter to tow. It has well-placed storage throughout, including inside cabinets that allow keeping clothing and gear in the sleeping space. The kitchen folds down quickly and includes a high-quality Dometic sink and stove. While the Off Grid is ideal for my needs, it is not without a few faults. The sprayed-on insulation is a nice idea, but it looks unfinished and will trap moisture, causing corrosion. The roof tent would have to go, as it only makes sense for a family with kids. The Timbren suspension is adequate, but I would want a system with shock damping and longer travel to endure the kinds of roads I travel. Fortunately, brakes are an option but were sadly missing on our test unit. In the end, every trailer is a compromise in some fashion, but the Off Grid was my best choice. Canada’s Off Grid Trailers (OGT) offers its own take on compact, ultra-rugged off-road camping trailers, ripping any and all wood construction right out and replacing it with stronger, more reliable metal. That means a steel main frame with aluminum side panels and roof sheeting. 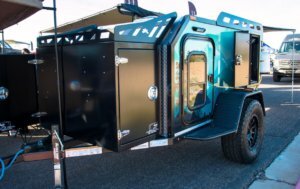 The Expedition pictured is OGT’s military-inspired off-road trailer, and though it’s the company’s burliest build, it’s also lighter than its others at 1,750 lb (794 kg). The sharp-angled, 13.8-foot (4.2-m) squaredrop rides on a lifted 3,500-lb Timbren suspension and 32-in Toyo Open Country AT II tires that give it close to 24 in (610 mm) of ground clearance. It also comes standard with a queen mattress, dual deep-cycle batteries, a fold-out kitchen with sink and dual-burner stove, a 60-L fridge/freezer, and an exterior-mount on-demand hot water heater with shower attachment. Base price lists in at US$23,900.